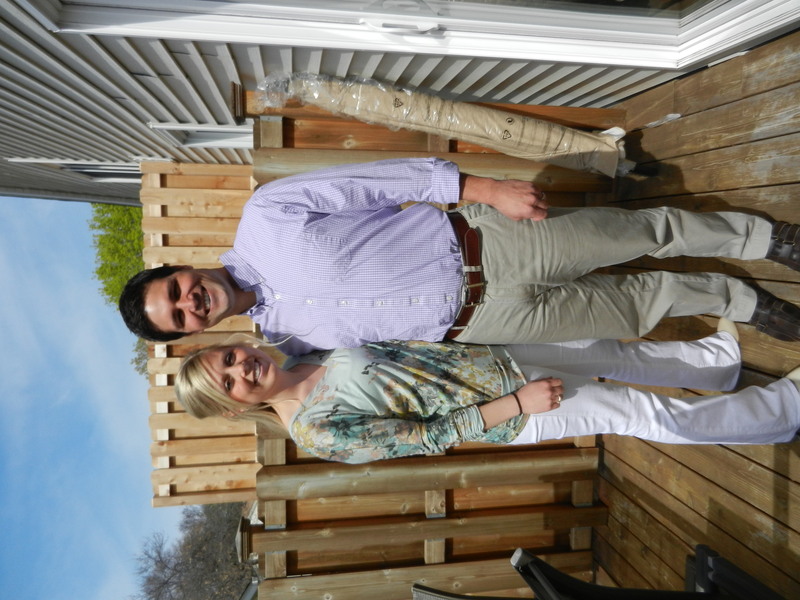 Easter #2 at my mom and dad’s was a success! The Easter Vigil at our church was beautiful, the weather was gorgeous, the company was outstanding, and of course, there was plenty of food and treats. 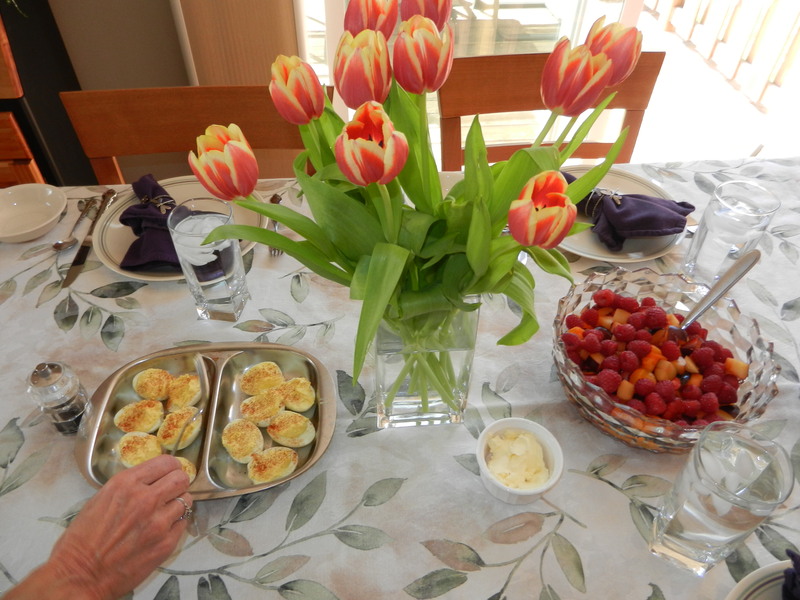 I adored these coral and yellow tulips mom had on the table, so beautiful. I tried out a new recipe for parmesan potatoes which was super easy. 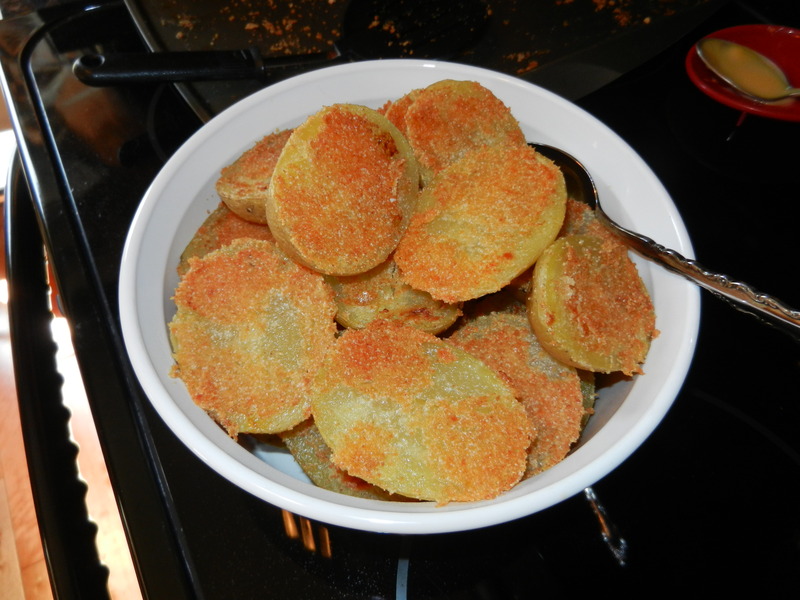 I simply sprayed a large baking sheet with non-stick cooking spray, sprinkled the pan with grated parmesan cheese, garlic powder, and a little salt, then placed halved (small) potatoes cut side down on the pan. I sprayed the round topside of the potatoes with cooking spray before I placed them in the oven. They cooked at 325° (since that’s the temperature the ham was cooking at) for about 50-55 minutes. They turned out golden brown with just the right amount of saltiness and crisp. 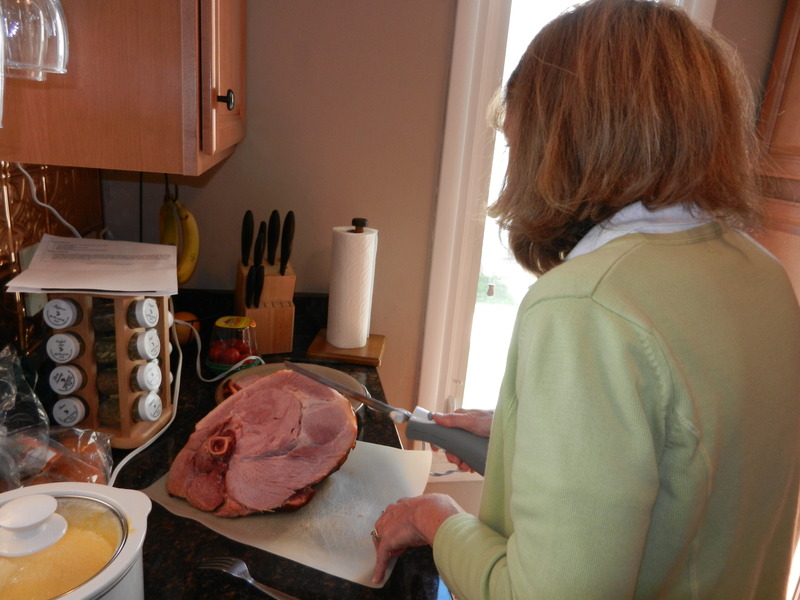 Mom using an electric knife to cut the ham in the kitchen. It works like a charm. 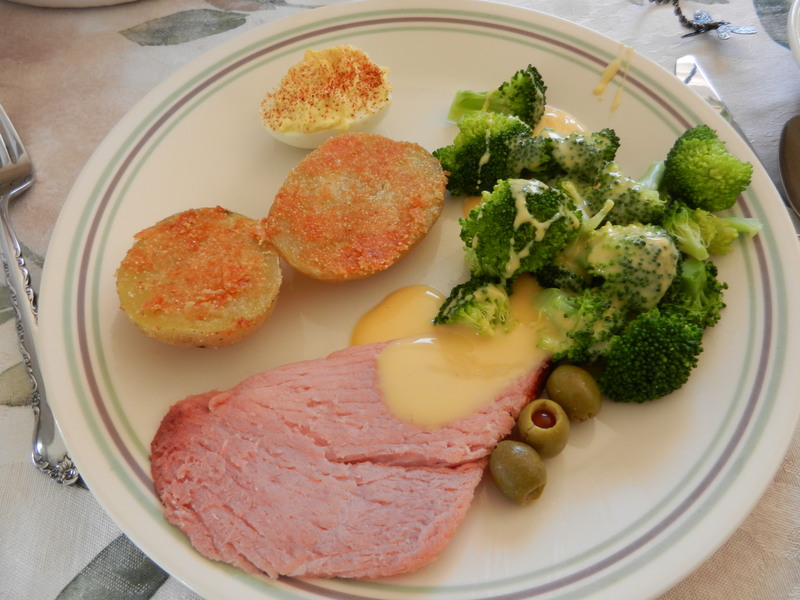 My plated dinner: ham, parmesan potatoes, broccoli with cheese, deviled egg (went back for another) and olives. 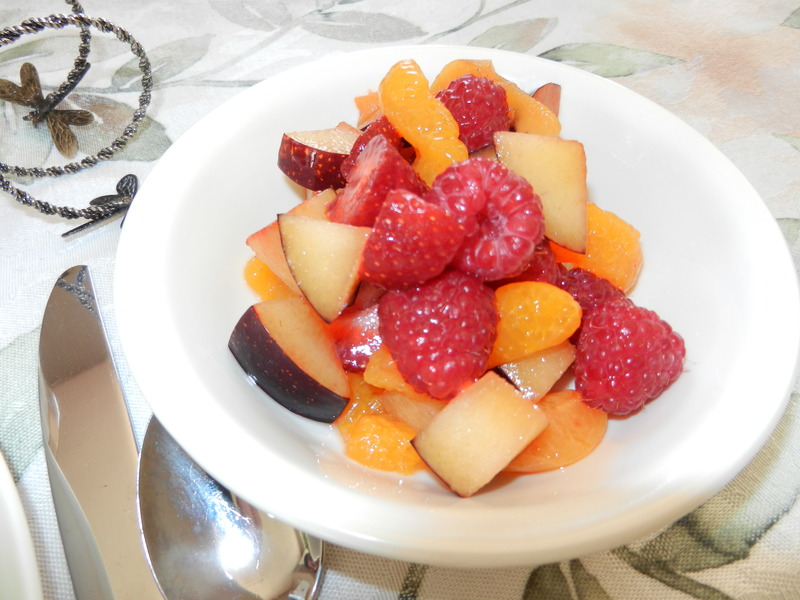 On the side was a bowl of sweet and colorful fruit: strawberries, plums, apricots, mandarin oranges, and raspberries, all drizzled with a little honey. I offered to be in charge of the fruit salad, and desserts, which is why I spent most of my Saturday in the kitchen. To me, being in the kitchen baking treats is very fun and relaxing most of the time. I truly enjoy it. I had tentatively planned my dessert menu a few days ago, and decided to bake up all three options I had mentioned but put my own spin on them as I love to do. 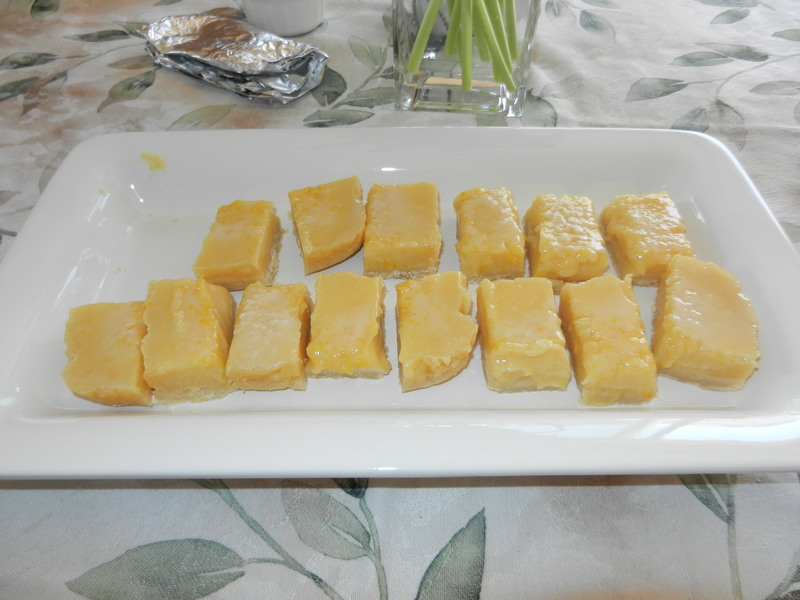 I made homemade lemon bars…. 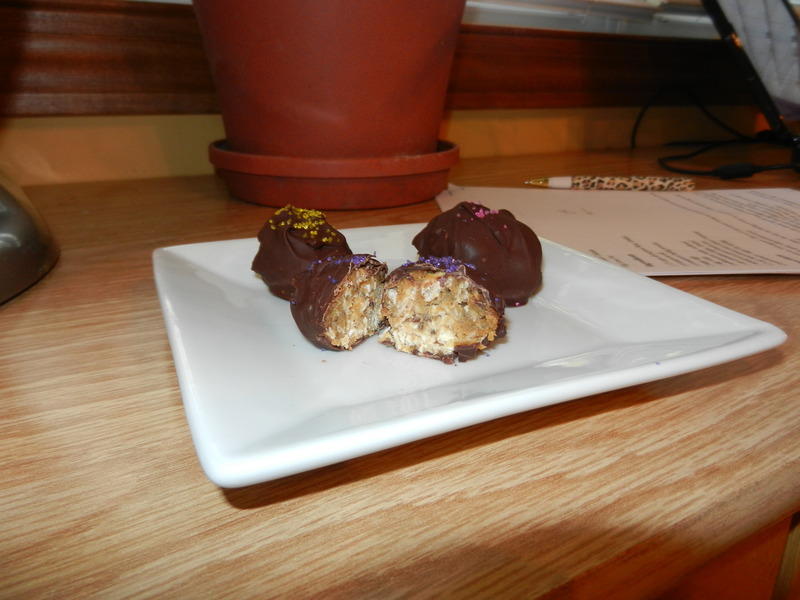 Healthier “Reese’s” Peanut Butter cups and I absolutely must share this recipe with you soon. These little eggs were so unbelievably melt in your mouth good to me, and the ingredients will surprise you! 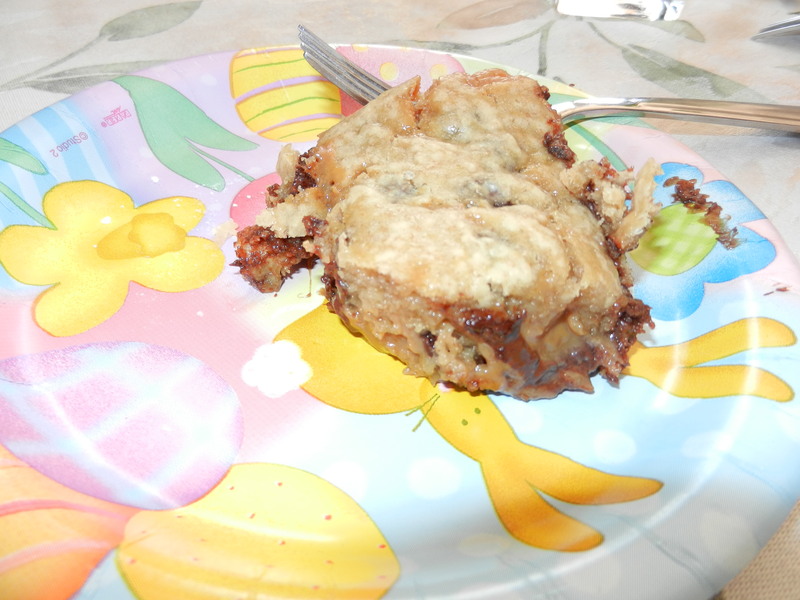 And the grand finale dessert…….drum roll…..Chocolate Chip Caramel Bars. OMG. These put me into a sugar coma today, but they were AWESOME. Really, how can you go wrong with chocolate and caramel? Not pictured is two Easter baskets full of goodies which are now nestled into our cabinets at home. I strategically placed them on a shelf that is not visible right away when you open the cupboard so that I will be less likely to grab for them. I will really need to be on my best behavior while these sweets are around. My body was in a little bit of a sugar shock today but don’t get used to it! Needless to say, I had an amazing Easter weekend. I got to spend a lot of time with my families who I love to pieces. I have a couple of recipes to share with you all, so check back soon. I hope you all had a wonderful weekend as well. Now, back to the work week we go. I have a lunch packed full of fresh fruits and veggies to help me “cleanse” after this weekend’s indulgences. Please offer your Positive Monday Talk. I’m sure we could all use some extra support today! 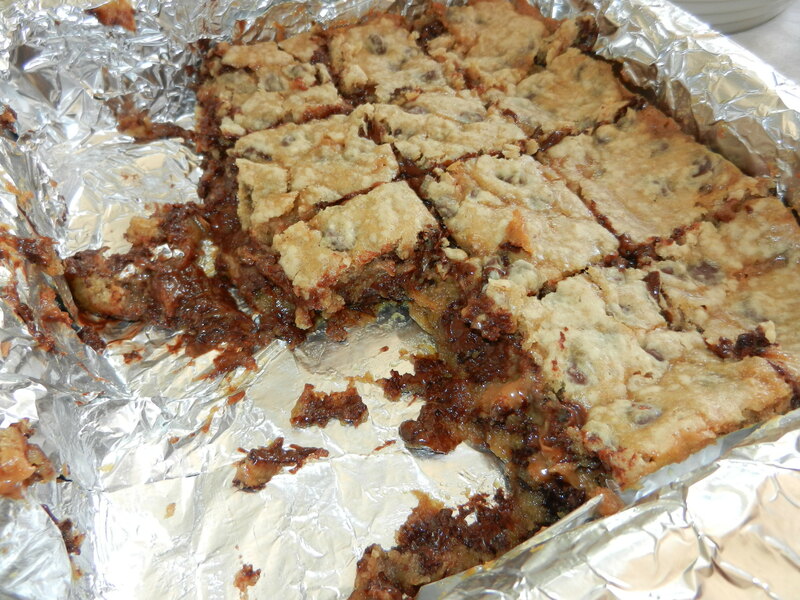 This entry was posted in Dinners, Family, Recipes, Sweet Treats and tagged chocolate, Holidays, peanut butter by Melanie. Bookmark the permalink.